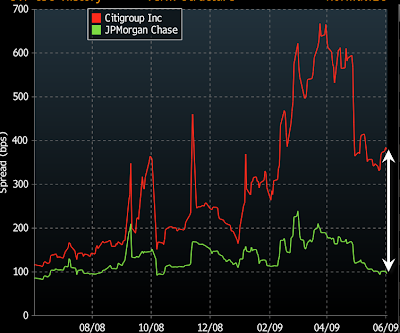 The market now views all major US bank credit risk as falling between the highest risk bank, Citi and the lowest risk bank, JPMorgan. The market prices credit risk in the form of Credit Default Swap (CDS) spreads (protection premium). The two banks' 5-yeard CDS span the range roughly between 100bp (JPM) and 400bp (C) with all other major banks falling in between. Within that range bank risk is clustered into two major risk groups. 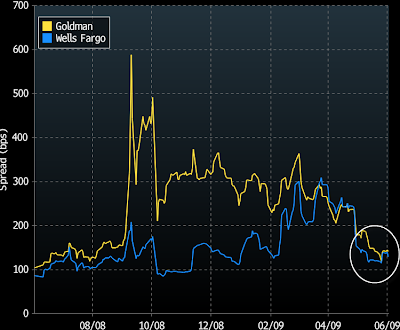 The lower risk cluster is represented by Goldman and Wells Fargo. Other banks generally fall into one of these clusters as well, but these are the most representative firms that drive the bulk of the risk in the financial sector. The market is now putting a value on the level of capitalization and risk for each of the institutions. 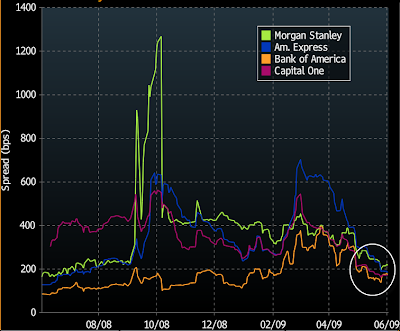 The market in effect created its own bank stress test indicating which banks need more capital and what the risks are in raising that capital.